On Thursday, March 6, 107.5 The River will host its annual STAR PARTY, a charity concert sponsored by H&R Block featuring GRAMMY Award-winning talent Colbie Caillat, Hot Chelle Rae and A Great Big World LIVE at Anthem in downtown Nashville. 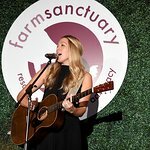 All proceeds benefit Musicians on Call (MOC) Nashville, an organization that brings live and recorded music to the bedsides of patients in healthcare facilities. Tickets went on sale this Friday, February 14 at 10 a.m. CST and can be purchased HERE. Tickets are $45 for General Admission, $65 for VIP and $125 for the VIP package including artist meet-and-greet passes. 107.5 The River and MOC will also be auctioning off a VIP Experience which includes premier side-stage seating for up to ten in addition to a meet-and-greet with Caillat, Hot Chelle Rae and A Great Big World. For more info, click here. Caillat, known for her breezy lyrics and California-casual style, is one of pop music’s most talented singer-songwriters. Her hits include “Lucky” with Jason Mraz, “Hold On,” “Bubbly,” and “Brighter Than the Sun.” Joining Caillat for this year’s STAR PARTY is Hot Chelle Rae – a hometown show for the East Nashville rockers recognized for smash tunes “Tonight, Tonight,” “I Like it Like That” and their latest “Don’t Say Goodnight.” Melodic duo A Great Big World made waves in late 2013 with their platinum-selling, monster hit “Say Something.” The soulful pair recently released their debut album Is There Anybody Out There. Since MOC launched a Nashville branch in 2007, MOC volunteers have played for more than 75,000 patients, families and caregivers in Middle Tennessee through 13 weekly programs in eight area healthcare facilities. Events like the STAR PARTY help support MOC and its mission to deliver the healing power of music to those who need it most. Please visit www.MusiciansOnCall.org for more information.